BugMeNot.com - Tell everyone you know. Because Common sense isn't. For OakRidger.com, for KnoxNews.com. The figure above, showing capacity factor versus time, and table below, with some additional data, summarize the plant's historical electricity production, based on the recently released update from TVA. As always, TVA still refuses to provide timely or detailed information regarding the performance of their wind power plant, even when requested under the Freedom of Information Act. TVA continues inconsistent data reporting, although the last two reports were both for 3 month periods. TVA last reported end of February data two years ago, in 2002. One year data, based on interpolation, and two year data are reasonably consistent, however. Annual energy production from February 28, 2003 through February 29, 2004 was approximately 3.96 million kilowatt hours, which is slightly higher than the last three reports (approximately 3.92 million kilowatt hours from November 30, 2002 through November 30, 2003; approximately 3.66 million kilowatt hours from August 31, 2002 to August 31, 2003, and (3.74 million kilowatt hours from April 2002 to April 2003). Compare this production with TVA's original announced, annual goal (pre-operations) of 6 million kilowatt hours, and TVA's announced revised annual goal (2002) of 4.6 million kilowatt hours. They need to achieve 27% capacity factor to meet the revised goal; however, they are averaging about 21 to 23%. Over a total of about 40 months of operations, having produced a total of 12.7 million kilowatt hours of energy, the plant has averaged approximately 3.8 million kilowatt hours per year, or about 17% below the revised goal. 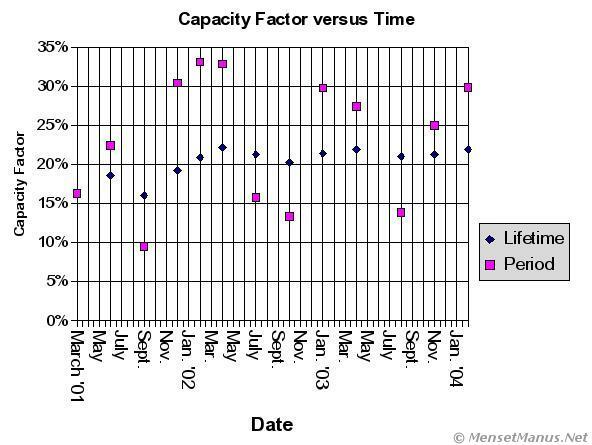 The capacity factor for the latest 3 month period was about 29.9%, which is significantly above the long-term, lifetime average capacity factor of about 21.9%. In other TVA "Green" Power news, production data for Middle Point Landfill has not been reported for the last three newsletters, or for about 9 months. Could this conspicuous absence be due to these reported environmental problems at the facility? As usual TVA's newsletter focused on "education" of children about the benefits of "green" power and highlighted various companies and individuals who support "green" power. TVA also continues to publish their unjustified "story" about green power, which still primarily comes from burning natural gas from sewage and/or landfill gas, being equivalent to planting trees. November 1, 2000 - "Operational Date"
The real Amphitryon is the Amphitryon who gives dinners. Images stored locally for protection of your privacy (unless/until you search with Google). Disclaimer Fine Print: This site is personal, and is independent of TVA or any other organization. Use of the abbreviation "TVA" is purely for descriptive purposes (for example, to distinguish from wind power plants on Buffalo Ridge in Minnesota). No endorsement, no approval, and no involvement by TVA is implied. I last touched this page on Saturday, 2007-11-17 at 05:09:05 UTC.